The one thing all great heroes have in common is a robust Rogues' Gallery. Unfortunately for Booster Gold, he's too efficient. He rarely fights anyone more than once. Among the few heroes to make a repeat appearance in the pages of Booster Gold is Broderick, the 25th-century cop who pursued wanted felon Michael "Booster" Carter back in time. Broderick had Booster Gold cornered in Booster Gold #18 before being distracted by a chance encounter with a liquor store robbery. That was the last we saw of Broderick, but more than one fan has assumed that writer Dan Jurgens had intended for the character to play a bigger role in the series. Is there any truth to that conjecture? I decided to ask Jurgens directly. Oh, Broderick was absolutely going to resurface. Had a very particular way it was going to work where, in true time traveler fashion, he'd pop up out of nowhere in the most unlikely of places. 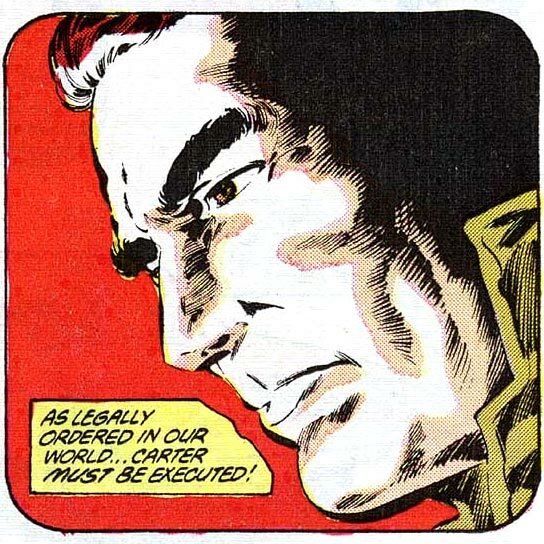 In a way, he was the precursor to the first Linear Man story I did in Adventures of Superman. The Linear Man first appeared in Adventures of Superman #476 as a time agent trying to bring Booster Gold to justice. Hmm, yeah, I guess I can see the similiarity there. Fascinating. A hearty thanks to Dan Jurgens for his cooperation in exploring the rich history of his creation, Booster Gold. The pre-52U had several time dislocated characters that were forgotten, but Broderick was the one that had so much story potential. If you had two Booster Gold autographs and Booster gave you six more, how many autographs do you have? If a villain held five hostages and Booster Gold freed two of them, how many hostages remain?